Going to a writing conference is a wonderful experience. Each has its own personality and focus. For me, Malice Domestic, which occurs near Washington, D.C. at the end of April or beginning of May, is a warm family reunion of readers and writers, all relishing the strategies for puzzling out traditional mysteries. Bouchercon--taking place this year in Toronto, Canada--gathers together writers from all the mystery genres, from cozy to thriller, in a huge celebration of variety and skill. Killer Nashville is the one conference I’ve attended that consistently has the effect of revving my writing engine. Although it welcomes both readers and writers, its primary focus is on the writing craft and criminal process. It features experts discussing developing characters, structure, and marketing as well as accurately portraying poisons, police procedure, and protocols. Each year, a member of the Tennessee Bureau of Investigation sets up a crime scene and participants try to solve who did it. The lucky winner receives a free registration to the next year’s conference. 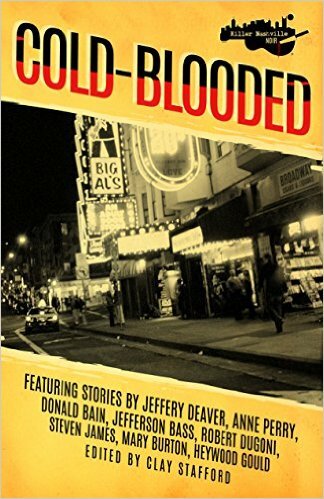 I have a lot of gratitude for Killer Nashville because it gave me the opportunity to be in the anthology Killer Nashville Noir: Cold Blooded (for “A Matter of Honor” written with Robert Dugoni) among such fabulous talents as Jeffrey Deaver, Anne Perry, and Catriona McPherson. This year, I delighted in being introduced by Guest of Honor Chris Grabenstein to publicly read the opening of the story. Reading from "A Matter of Honor"
Clay Stafford, the founder and creative genius behind Killer Nashville, gives those attending lots of opportunities to serve on panels. This practice helps authors to develop their confidence in appearing before their peers and also helps panel members to meet and bond. I felt very fortunate this year to participate on four panels. Creating and Weaving Subplots was moderated by Kelly Oliver (who won the Silver Falchion for Best Attending Author) and included Mary Davidsaver, Susan Page Davis, Tracee de Hahn, and Rick Helms (whose extensive work with the South Eastern Chapter of the Mystery Writers of America was recognized with the Magnolia Award). Catherine Dilts did a great job in providing a panel summary in her blog. Writing Medical and Legal Thrillers, moderated by Charley Pearson and featuring Claire Applewhite, Judith Lucci, Linda Petrilli, and Doug Woodward all with medical backgrounds (I was the sole representative for the legal field), had a fascinating discussion about how reality and imagination can develop truly riveting stories that carefully adhere to medical or legal principles. I always love talking about writing short stories. Our panel moderated by Jenean McBrearty was a particularly fun group, including my pals Debra Goldstein and Robert Mangeot and new friends Warren Moore (who teaches at Newberry College in South Carolina) and Kathryn Lane (whose novel Waking Up in Medellin won the Silver Falchion for Best Fiction Adult Suspense). Again, Catherine Dilts provided a terrific summary. My final panel, about writing with a collaborator, had just one person attending, but led by our moderator Mike Rubin, we went forward and enjoyed a lively discussion. Barbara Collins, Max Allan Collins (another Guest of Honor), and Susan Page Davis were the other panelists. Being at Killer Nashville led me to become involved with the board of SEMWA. We have an enthusiastic organization. Our president Maggie Toussaint is a dynamo and board members Stacy Allen, Nancy Sartor, Susan M. Boyer, Phil Hardwick, and John Gordon work diligently to organize programs and retreats to benefit our members. Past President Beth Terrell continues to provide us with wise counsel, and we were very proud and celebrating with her when she was honored with the Builder’s Award at this year’s Killer Nashville. Over the years, those who have come as Guests of Honor or attendees have enjoyed the experience so much that they have created four scholarships to enable other writers to attend. Past scholarship holder and a Claymore finalist this year (and a writer to be watched), Kathleen Donnelly, spoke about what the opportunity to attend Killer Nashville had meant for her writing career. Her speech is published on The Stiletto Gang blog. If you have an interest in a smaller conference that concentrates on writing skills and expert procedural information, please consider coming to Killer Nashville. I think you’ll find a place where you’ll want to return. How do conferences enrich your writing? I'll think about Nashville for next year. It's an easy days drive from Cincinnati. I'm headed for a Sisters in Crime forensics workshop in Columbus this weekend. Great post here! I need to get to Killer Nashville myself one of these years.... Always enjoy Malice (and seeing you there!) and Bouchercon. So many great conferences! Thanks, Paula, for your recommendation of Killer Nashville. It's good to know it's a worthwhile conference for writers. I've attended Malice Domestic, primarily a fan conference, several times and enjoyed it immensely. Another conference that I've enjoyed is Sleuthfest, another conference for writers. In November, I'm going to attend New England Crime Bake for the first time. Conferences give me a wonderful opportunity to talk with other writers. I've been to Killer Nashville and it was great. I'd love to get to Killer Nashville. I've been to Malice Domestic (it's not far from where I live) and Bouchercon (I'm going this October) but I'd like to try another, smaller one soon. Margaret, I think you would really enjoy it. The forensics workshop sounds like a terrific resource. Art, it would be great to have you come to Killer Nashville. I will really miss seeing you at Bouchercon this year. Grace, Sleuthfest and the New England Crime Bake are definitely on my list of conferences to attend. Warren, I remember us being on the short story panel at Killer Nashville. What a wonderful experience! Kathleen, so delighted to hear you are going to Bouchercon. I think you'll have a terrific time! Oh, Paula, this sounds fabulous! Definitely on my list. Maybe next year???? Thank you for sharing. Kait, I hope you can make it. It's always informative and lots of fun! I guess the lone attendee of the collaborator's panel didn't have a collaborator? Not yet, but she wanted to know what to do when she found one! How neat. I love Killer Nashville and go every year. My post on Make Mine Mystery tomorrow is on the same topic. I have pictures of the panel I was on and talk about how fun a place it is. I could not go all three days this year because of starting a new job. Enjoyed this. Thanks, Linda! I definitely will check out your post. Great post! So glad I got to meet you!